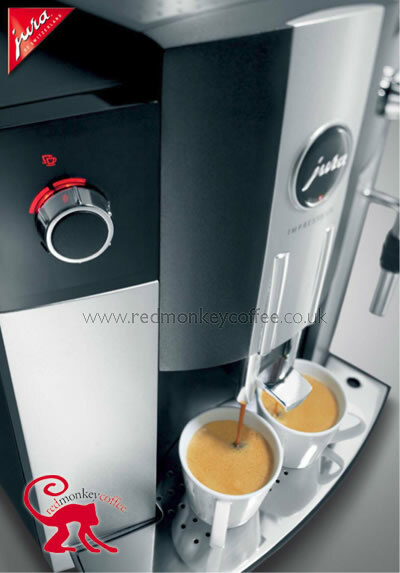 Jura C5 Espresso Machines - Red Monkey Coffee UK Jura Impressa C5 UK Jura C5's automatic espresso machine and Bean Grinder combo at discount sale prices. Espresso makers all can make excellent Cappuccinos, Espressos, Caffe Lattes and just great coffee. Free UK Delivery. Plus pay by DEBIT CARD & get an extra 500g of coffee or £8 to apply to what you want! Don't like these free extras? No problem they are flexible, apart from the delivery we can change any items for whatever you want up to the same value, all part of Red Monkey Coffee's service. Simply order and list what you want instead in the comments box on the order page or call and we can work it out with you, call freephone 0800 321 3357. Combined with the Auto Cappuccino unit to hold the milk, double walled design keeps milk cold & fresh out of the fridge for longer. 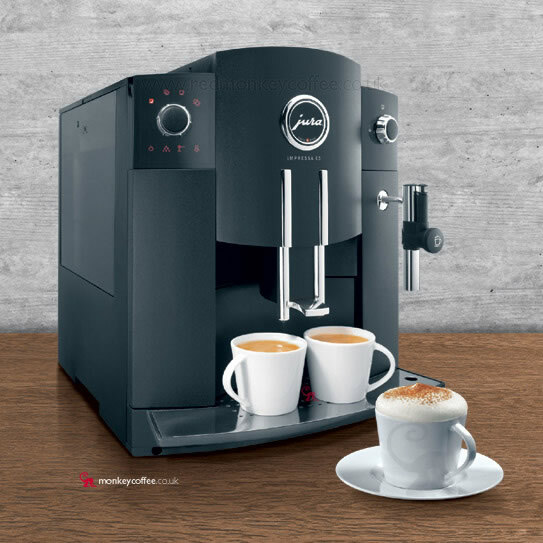 With stylish Swiss design and quality Swiss build the Jura Bean to Cup machine range is the latest in espresso coffee making technology. These machines will produce professional quality espresso at the touch of a button in a matter of seconds. All the machines can produce espresso coffee in a number of variations of strength & quantity to suite your taste, you can then add milk to make your cappuccino, latte, or any other drink, even a scoop of hot chocolate turns a cappuccino into a sneaky mock - mochaccino (free red monkey coffee tip for you there!) The machines also have the optional (all though some come with it) Auto Cappuccino Frother, this takes the mess out of milk frothing by drawing the milk from a container, frothing, steaming and dispensing directly into your cup! No waste, no mess. These are the top of the range in Bean to Cup machines on the market, highly recommended. 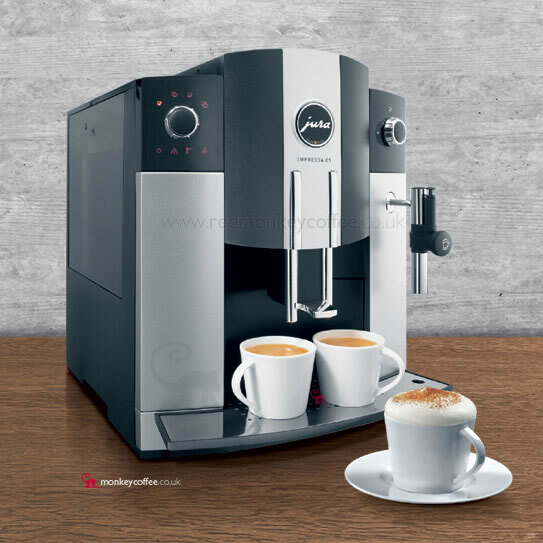 The IMPRESSA C5 demonstrates how simple the enjoyment of a perfect cup of coffee can be. The latest addition to the IMPRESSA compact line sets new standards in coffee quality and looks as good as its performance. One of its most outstanding features is the smart operation: a whole range of coffee specialities can be made using a single control. Coffee and milk specialities, Simple use by the push of a button, Easy-to-understand symbol display, Compact design. Thanks to the revolutionary, single Rotary Switch operating system, you are now just the push of a button away from a perfect cup of coffee. Simply turn the switch to choose between coffee and espresso, select one or two cups, and click. Seconds later, enjoy. The easy-to-understand displays are illuminated in red and provide all the information you need.Within easy reach of the Rotary Switch and discreetly concealed are the maintenance buttons with their own illuminated displays. Whether it's a small espresso cup or a large one for your breakfast coffee, the height of the coffee spout can be adjusted continuously to between 65 and 111 mm and fits any size of cup. This prevents unsightly splashes on the machine and guarantees a sumptuous thick crema. It is also beautifully designed. The Connector System© allows you to use the Easy-Auto-Cappuccino Frother, a dispenser for an even, regular hot water jet, and the optional two-speed milk frother or the Professional Cappuccino Frother to make perfect milk foam or hot milk. Some of the Jura technology explained, at Red Monkey Coffee we give you all the information. One of the secrets of perfect coffee: The coffee powder is moistened before the actual brewing process starts. The quantity of pre-brew water is adjusted to the powder quantity automatically. The result: full aroma and a velvety crema. Patented variable brewing unit. Adjustable between 5 & 16 grams of coffee. Ensures optimum pressure and brewing conditions with any quantity. 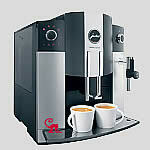 Allows for 2 cups in one brewing operation, making all Jura machines genuine 2-cup machines. The hardened stainless steel cones are wear-resistant and have a long service life. The high-precision conical grinding gear produces a heterogeneous mixture of fine powder and coarser particles. You can adjust the optimum grinding degree for your favourite coffee. The Claris Water Filter installs directly into the water tank. Filters the water to purify and remove the causes of lime scale, it also makes the coffee taste better as the water is purified. Available to order online here. Full Manual & Technical Specifications (PDFs) Downloads require Adobe Acrobat Reader. If you have any questions about the operation of the machine what better way to find to out about them than to look at the manual, this will tell you exactly how the operation is carried out and exactly what the machine can do. Or give us a call on Freephone 0800 321 3357.